It's probably from the hyperflexible joints that you have. I think of the sayings that relate to people who "bend over backwards" to please or help. At the fingertips I would add flexibility of the mind. Bending ulnarly - would have each tip leaning toward the next. That reminds me of a very old piece of art (I think Manfred uploaded it once) of the fingers with faces looking in different directions on the finger tips. 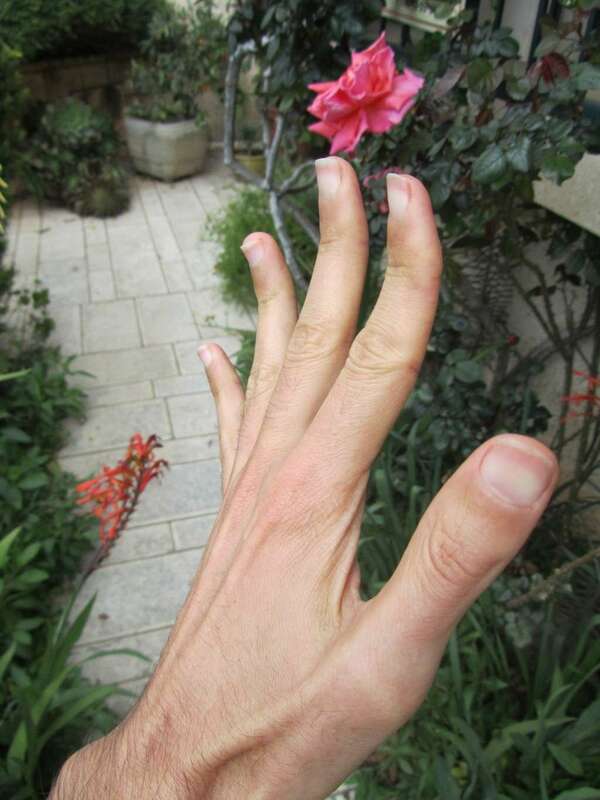 Leaning ulnarly, might also relate to the ulnar side of the finger being slightly shorter than the radial side? Haha. I like the twist in the story. I can somewhat "bend backwards" to help people, but not to appease. People often don't really seek my help because it is usually on my terms and they find it too taxing to follow. Flexibility of the mind is probably true. The twist takes place when I bend the top phalanges backward. i don't think the ulnar side is shorter but difficult to tell. Thanks for the feedback. If pleasing were the interpretation, then markings in the hand would show that. Such as many influence and empathy lines. Lines that radiate out from inside the life line. Doesn't Fincham call these stress lines? zaobhand wrote: Doesn't Fincham call these stress lines? stress, worry, influence... etc. They are lines that show something in your world is disrupting things. I guess "influence" can be milder for people to hear relative to worry and stress. It is not clear how to relate influence to worry and stress (English-wise). If a person is sensitive to and aware of other people's projections at them, the degree of this sensitivity and their response to this sensitivity can show in these lines. People who don't worry and stress about things, but instead tend to deal with what comes their way head on, lack these lines. It makes sense that people's response to sensitivity can show in these lines. Still the naming convention "influence" doesn't sound fitting to me, perhaps because I'm not really native English speaker. Have you noticed radial loop on index people exhibiting more of these lines? Not sure though whether this marking are more aware of people's projection at them than ulnar loops. "It makes sense that people's response to sensitivity can show in these lines. Still the naming convention "influence" doesn't sound fitting to me". Here the people are "responding to this sensitivity(to others projection)". In effect, they are "influenced". B.t.w. Boaz, can you touch the moon zone of your palm from the thumb of the same hand? Just curious to know. I think a name should be self-contained like a good title of a book or article. It doesn't require an explanation through another concept. I am also not sure that being influenced (sensitive to other people's projection on them) is the primary cause of stress and worry. I can't reach the lunar quadrant with my thumb. It barely touches the heart line. Are you saying the term "influence" is of wider meaning and shouldn't be used here? And in my understanding, "being influenced" is also the cause of stress. For ex: The bearer of these lines does few things to consider other's wishes and needs, though, he/she isn't comfortable with it. Or others are interferring in the activities of the life of the bearer of these lines, causing them stress/worry. If one accepts the influence and are progressing about it, it won't appear as a stress. But, if the same influence is resisted or is hindering the progress, then its a stress/worry on the bearer of these lines. "Being influenced" is not "influence". I am searching the dictionary for an adjective that means "being influenced". Perhaps someone has suggestion. Yes, I did say that being influenced is cause for stress but not sure about its being the primary cause for stress. Its an interesting idea though and may hold true. Thinking about this now. It makes sense that when one 'considers' other people they will be more stressful. It suggests that if someone does not consider other people, they will not be stressed? Now, I got what you're saying. Yes, here "influence lines" mean that the subject is influenced and not that the subject has the ability to influence. Instead of saying "being influenced", it can be said that - "someone is influencing the subject". - It doesn't matter when one consider's other people or not. But, what matters is whether its causing progress or digressing the growth and more importantly, how the subject is receiving the ideas/the interference of the others in his life. If its causing digress and the subject isn't accepting the ideas/interference of others, he/she is stressed/worried. Based on what I have written above, complaisant doesn't suite to be the right word. Btw, I studied tabla for a month or so, but it was difficult to get the proper sounds with the index finger. The teacher thought it was because of the flexibility of top phalange. He advised me to study sitar.. That my hands are more suited for the sitar.. funny. He also mentioned that in his experience tabla players have more of a solid type of body and hand. Personally I think anyone can do anything, and I'm sure there are good tabla players with my hand-type, but on average it may make sense that tabla attracts people with earthier hands. Kiran.Katawa wrote: Now, I got what you're saying. Okay. Yeah, may be that I have heard it so many times and I know its meaning and the effect and so the term "influence", immediately gets me a picture of what it indicates, though it has a broader perspective. Since, these are subsidary markings,may be there hasn't been a single term for them. Jennifer Hirsh calls them "Worry Lines" in her "Craft_of_Hand_Reading_A4" book. Regarding using the term influence for the lines that radiate out from inside the life line, I think Kiran has picked up the understanding of it that I wanted to convey. It helps a lot. Very informative and interesting. Still I think the name "stress or worry lines" fits better since it encompasses all the scenarios. But they have more of a negative connotation. I'm starting to get used to "Influence lines" but as I hear it I can't help starting to think what does this mean, rather have the content encapsulated by the name.